This is the final installment in our Straw Bale Gardening series, which follows a novice gardener’s attempt at her first straw bale garden. Also check out Part One, on setting up a straw bale garden, and Part Two, on planting and maintaining straw bales. My great enthusiasm for gardening in straw bales is overdue for a final follow-up. Did the straw bale garden method solve all gardening issues? Maybe not. Did it solve the major problems of soil preparation and weeds? Absolutely! – no need for tilling or even hoeing, no jungle of weeds by mid-July. Did it minimize plant disease? Again, absolutely! 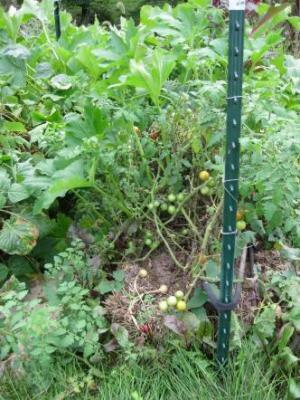 Nary a single sign of tomato blight! – though the long dry stretch of summer was at least partly responsible. Did straw baling control insects? Again, yes, mostly. Getting the plants up above ground level did minimize trouble with leaf-eaters. The biggest question: Was the harvest worthwhile? I was thrilled to grow the first healthy, productive crop of cucumbers I’ve ever grown. My hills of cukes produced plenty to share with my very appreciative chickens all through the late summer, with a 40-pound bag to spare when the frost finally wilted the vines. That’s the promise of crisp refrigerator pickles at least halfway through winter. 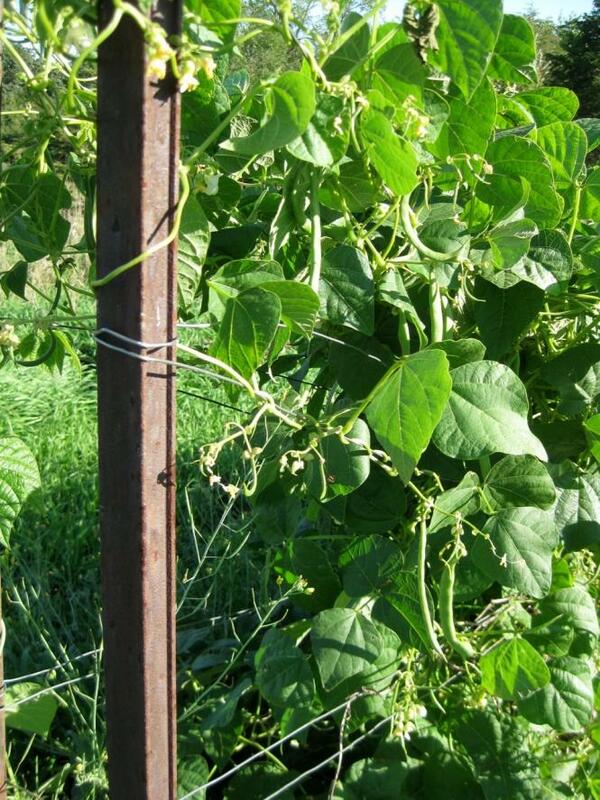 The garden also produced a bounty of climbing beans! Another variety I’d never tried before and found simpatico with the straw. My heritage tomato plants from Seed Savers, which got a slow start, ended up producing a regular supply of extra special, tasty fruit which ripened just in time to satisfy both our day-to-day hankering for BLTs and Caprese salads as well as the hungry little mice or voles that took up residence in the bales! Bad surprise for the salsa canning I imagined, but our mouser/cat couldn’t have been happier with the great long hunting season the straw bales provided. The situation with the mice had me worried about my potatoes. But, when I broke into the bales after first frost, it was a beautiful sight. 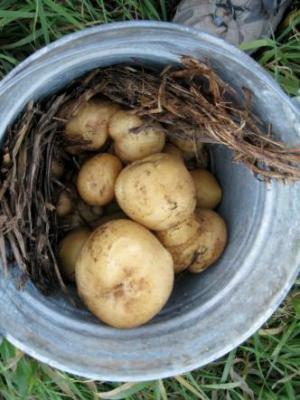 Each plant had a clutch of gold tubers nested close beneath it. Mice must prefer a low-carb diet. Carrots and beets? Those that did germinate gradually went missing. The crafty inhabitants of the bales left only wilted greens as evidence when they ate carrots and beets from below. My Seed Saver heritage variety peppers were overwhelmed by the gusto of the climbing beans and cukes, which I should have pruned back, but the beans and cukes were so much better suited to straw bales I let them have free reign. • Challenge number one had to be my lack of gardening sense. I learn a bit each year, but I still struggle with basics and I tune out too often when it’s time to pay attention. • Second, the strawbale method called for an experienced eye to “read” the bales. In the spring when the straw is still “conditioning,” nutrients are not available for germinating seed or transplanted plants. I mis-read the bales, which needed more water and more organic fertilizer to drive the bale conditioning process, to heat the straw up and break it down, before I added seeds and plants. • Third, the volume of water needed for a raised bed is typically greater than for a garden in the ground. And the volume needed for a strawbale garden is greater yet – far greater! This summer being one of the driest, hottest ever, the watering challenge became larger than life. Not the best yet to give this method a fair test. • Fourth, because this straw bale experiment proved a fairly water-intensive method of gardening, it’s important to be selective about which plants are a good match to the method. Seeds I planted this year did not stay consistently moist and did not germinate well – carrots, beets, arugula and other greens came up sparcely or not at all. It might make sense to skip trying to grow from seed. Also, to shy away from root vegetables (except potatoes) unless there’s a way to keep the tiny vegetarian rodents from finding the bales so inhabitable. Do I plan to plant in straw bales again? Sure. Why not? For me, the pluses outweigh the minuses, especially as I become more experienced with the gardening technique. I put by a straw bale supply that will let me set up again next spring. I’ve learned a bit about bale conditining, compatible varieties, and water requirements. And I also look forward to composting the rest of the straw into clean, rich organic matter for the raised beds I’ll set up in this garden area in 2014. 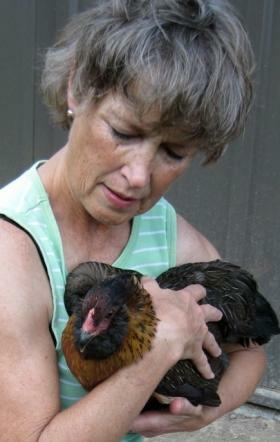 Kitty Baker grew up on a mixed ag farm, then in a small town, near Rochester, MN. She and husband Keith raised two daughters, living in Kansas City and Minneapolis. A professional writer, Kitty enjoys topics of lifestyle and food, especially since 1999, when they bought a farm, Root River Wilds, just north of Lanesboro, MN. The farm’s spectacularly varied acreage -- bluffs and woods, pastures and restored prairies cut with trails and wrapped in the oxbow of the North Branch of the Root River -- is rich with opportunities to discover and share ways to live abundantly. Her last article for SGT was: Straw Bale Gardening, Part Two: The Plot Thickens.